Why would ANYONE, buy an ice bucket or bother to go to Kickstarter crowdfunding site to get one? 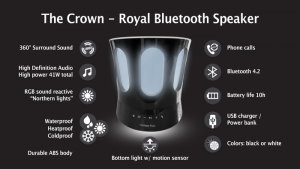 Because The Crown – Royal Bluetooth speaker is So Much More than just an Ice Bucket, and here is why it is the most funded Ice Bucket on Kickstarter! The Crown is a magnificent audio device. Everything else comes after that. The Crown was designed to a unique shape to give a 360° sound experience that will be extremely hard to beat. 2. The Crown was invented and designed by Jarno Voutilainen. The idea came from a quite uniquely Finnish need: he wanted to find a sound system for his new sauna that he was renovating. It might not sound like a big deal, or even a tiny issue in the USA, but for the Finns the sauna is almost as important as the house – or in some cases even more so. Soon it became evident that the only speaker system for humid, high-temperature room was both extremely expensive and it required an electrician to install the equipment. Rather than paying a ridiculous amount of money for something that wasn’t an absolute necessity in the sauna, rather it a question of prospering, Jarno Voutilainen decided to see if he could come up with something less expensive and most importantly user-friendly equipment that would need no electricians for the installation process. The innovation process formed into a pail, The Crown, that can be used everywhere, anytime and the functions are incredibly variant. 3. In no way this product is limited to sauna use. It is a multi-functional party necessity. 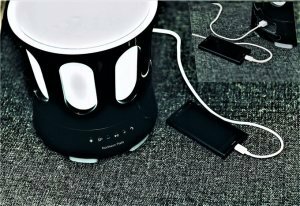 There is the amazing 360° surround speaker, the high-definition audio, total of 41 W power, the amazing RGB reactive light system of Northern lights and with that the pail itself has a motion-detection system. 4. That is extremely handy when the yard or the beach is dark after sunset. Usually you would need a flashlight but not anymore! With the Crown you have a flashlight that you will always find, even in the dark. As soon as you pick up the crown the whole bottom light up automatically, getting you safety on your way. 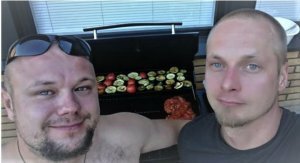 The pail itself is made of hard, extremely durable plastic, which makes it a perfect item to be taken to beach parties, garden parties, the gym like the European heavy-weight champion boxer Robert Helenius does. Also be-cause of the structure the pail is completely cold, heat and waterproof so it can be taken to a steam room, used as an ice bucket or a cooler and it can also stand sand and other dirt so taking it to the beach is a great. 5. Today’s people are more of less depending on their phones. The Crown can be used to make phone calls. There is the mic and speaker system for that. It can also be used as a USB charger for mobile phones or other USB-compatible devices. There is the 4.2 Bluetooth connectivity and The Crown has the incredible 10-hour battery life and can be charged by USB. I think it is practically impossible to innovate a better device that is both truly useful and an entertaining party prop. We were lucky enough to get an interview with the passionate inventor, Jarno Voutilainen, of Helsinki, Finland. Click here for the Crown’s kickstarter campaign and here for the Crown’s website.